Underground Storage Tank Installation in Wakefield MA | Petroleum Management Services, Inc.
A damaged underground storage tank, although hidden well, can be an environmental risk. Unfortunately for some, the damage isn’t visible until it’s too late. Our highly trained and experienced employees take every step to ensure each oil tank we put in the ground complies with manufacturer, municipal, state and federal safety guidelines as to maximize protection for our environment. 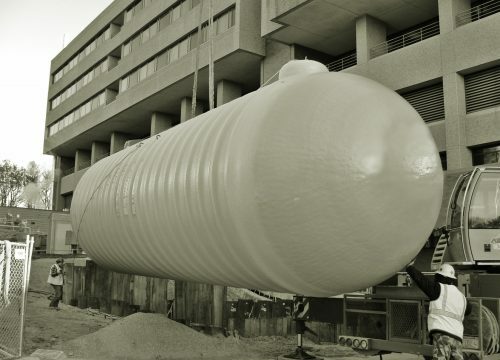 At Petroleum Management Services, we understand the regulations and hazards that come along with both installing and removing a storage tank. We take all the necessary precautions to handle these tasks and ensure a safe and efficient project. Corrosion is one of the common issues among businesses who have older tanks, which is why we encourage the maintenance programs. We offer services for corrosion maintenance and upgrades, overfill protection, spill containment and leak detection for the piping as well as precision leaking for the tank itself. With over 20 years in business, Petroleum Management Services has you covered. We go over our procedures from beginning to end and answer all questions completely. As a company that values our customers, we strive to meet all of your needs. Contact us today at 1781-245-3305!